Libraries in the United States use one of two systems to classify and organize print books and other physical materials. Many public and a few college libraries use the Dewey Decimal system. Most College and University libraries use the Library of Congress Classification system. 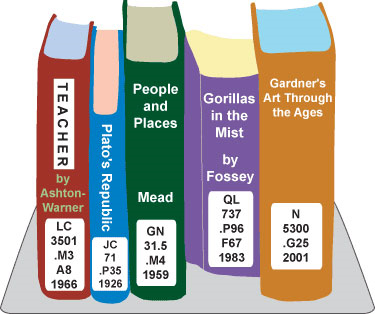 Both systems accomplish the same purposes – organizing the books into subject areas. The Dewey System assigns a number code to each book, while the Library of Congress system assigns a letter and number code. C -- General History, Archaeology, Geneology, etc. World History, History of Europe, Asia, Africa, Australia, New Zealand, etc. The arrangement of materials on the shelves is alphabetical by their classification letters, from A to Z and within each group numerically from 1 to 9999. Materials are labeled with their classification number on their spines, and code letters appear at the ends of each row of stacks. The call number is both on the spine of the resource and on the record for this book in the library's online catalog. The call number is called the shelf location on the catalog record. The letter part of the call number indicates the broad subject area of the book. The first number line indicates a more specific or narrower subject area. The letter and number on the third line are a code for the author’s last name. You can see that this keeps the books in a logical sequence on the shelves and that they are thus, roughly arranged by subject. The majority of our MCC Library Collection is now online (eJournal articles and eBooks). We add fewer new titles to our print collection each year. Please ask a librarian for help if you cannot find the book you need. It might be an eBook. The MCC Library has almost 220,000 FREE eBooks. The library’s collections support the mission, vision, values, curriculum, and priorities of MCC. For complete details see the MCC Library Collection Development and Management Policy. Donations will be assessed using the same criteria as for other materials.